In 2017, sixteen individuals (predominantly non-cyclists) came together to form a formidable team, ‘The Cyclopaths’. We trained hard for 10 months to achieve our goal of cycling 500km from Ho Chi Minh City in Vietnam to Angkor Wat in Cambodia. Not content with a physical challenge and the sense of personal achievement, we also set ourselves the challenge of fundraising for The Cure Parkinson’s Trust and raised an amazing £42,750 thanks to the generousity of family, friends, colleagues and at times, strangers. 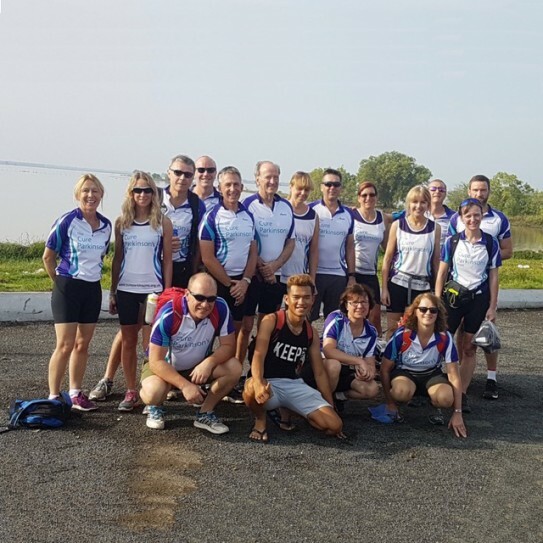 The Cure Parkinson’s Trust was the obvious choice for The Cyclopath’s as the team leader, Alison was diagnosed with Young Onset Parkinson’s Disease in 2015. The Cure Parkinson's Trust funds research into treatments that have the potential to slow, stop or reverse Parkinson’s Disease. Having achieved our initial goal, the team were keen to maintain our fitness, to carry on training together and to continue to support The Cure Parkinson's Trust, so we set ourselves a new challenge for 2018 - to cycle 1,000 miles from Land's End to John O'Groats (LEJOG) over two weeks. Unfortunately, four of the original Cyclopaths are unable to do this year's challenge but the team are delighted to be joined by some new recruits and in August this year, nineteen Cyclopaths will set off for the biggest physical challenge any of us has ever undertaken.